The Child Development Program at the El Dorado County Office of Education (EDCOE) is pleased to announce that they have moved their Montessori State Preschool program to the Valley View campus in El Dorado Hills for the 2017-2018 school year, and the traditional State Preschool program at Valley View moved to the Blue Oak campus. The Child Development Program currently operates a total of six State Preschools, Head Starts and Inclusion programs on Buckeye District campuses. 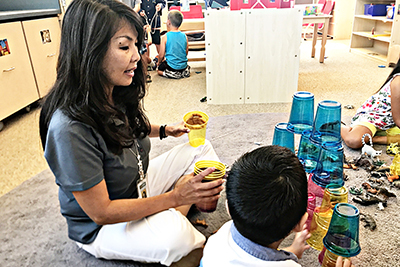 “We are fortunate that Buckeye administration values school readiness and that we have a collaborative relationship with Buckeye and their leaders that supports the school readiness of our youngest learners,” Mary Viegas, Executive Director of EDCOE Child Development Programs, explained. While working hand-in-hand with Buckeye Unified School District, the programs have cultivated strong relationships with their students and families. Applications are currently being accepted for all Head Start, State Preschool and Home Visiting Programs throughout El Dorado County for the 2017-2018 school year. We are asking families to please call the main Child Development Program phone number at 530-295-2270 or 530-543-8242 for the South Lake Tahoe office. Please call us for more information about our 23 preschool programs or home visiting programs available throughout the county.